The Rose CrystalView CRK-1DTXT-EX/A1 is a DVI / USB 2.0 / CATx KVM Extender for your keyboard, mouse, DVI, USB 2.0 and audio. The unit extends up to 1,640ft via CAT5 UTP providing full operation and control of computer and USB devices. In addition to extending three USB devices, you can add up to 4 standard USB hubs to access additional USB devices. Connecting 4 USB hubs to the receiver will increase the number of USB devices that can be connected to a maximum of 13 devices and 4 hub levels.The CrystalView DVI EX supports DVI-D video at resolutions up to 1680 x 1050. 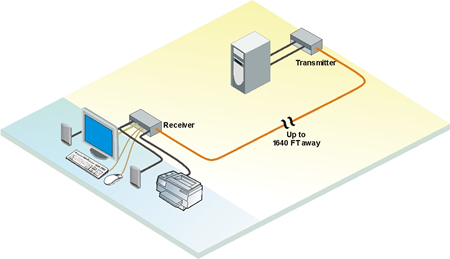 Stereo, audio and a microphone can be transmitted in either direction across the CAT5 link simultaneously. This KVM Extender supports all types of USB devices such as printers, scanners, hard drives, and audio devices. Access to your computer is made convenient in a variety of situations by situating users away from hazardous industrial environments, CPUs from areas vulnerable to theft of hardware and data, reduce noise, heat, and increase desk and floor space. Question: Can you also use a local console (montior, keyboard & mouse) at the PC without disconnecting this remote unit? Answer: In order to connect at the local end, you must have the ports available to do so. This extender will utilize your video(DVI-D) and a USB port. Assuming that you have additional ports to utilize, then you would not need to disconnect the extender. If you do not have additional free ports(DVI-D and USB), then you would have to disconnect the local (transmitter) unit. There are CATx KVMs and IP KVM solutions that have a local and remote console. For further assistance please call us at 1-877-586-6654. Question: Can we connect any usb printer from receiver unit? Answer: Thank you for your inquiry. This extender supports USB 1.1 and/or USB 2.0, so should work with most, if not all USB printers. However, different user environments may impact compatibility. Question: Can we connect with Dot matrix printer EPSON LQ300II? Answer: Thank you for your inquiry. We have not tried attaching an EPSON LQ300II, but as long as the printer meets the required specifications, it should work. Having said that, because user environments can be very different , we could not guarantee 100% that it will work. Question: Are there any compatibility issues with using this device on a USB 3.0 port? Answer: Thank you for your inquiry. This particular unit does not have native USB 3.0 support. That being said, the USB standard is fairly backward-forward compatible and we have not heard of any particular issues using USB 3.0 ports. However, due to the complex nature of user environments, we could not 100% guarantee compatibility.